One of the most important traditions of Thanksgiving is sharing food with those who are close to you to show your appreciation and affection for each other. Share a little love this Thanksgiving, with our Thanksgiving Basket. Full of a variety of snacks and goodies, it is great to give to someone who can’t come this year or to pass around while everyone is waiting for the big meal to be put on the table. 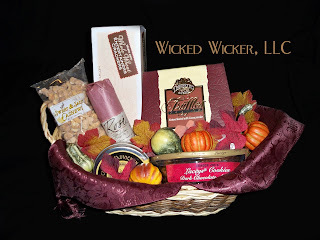 Happy Thanksgiving from Wicked Wicker! WEF vs NAWBO Board Bowl-Off is this Sunday!